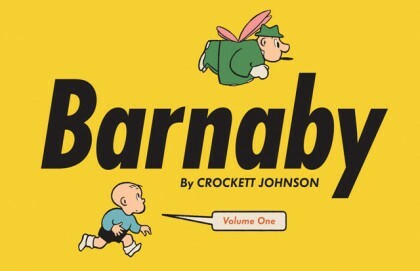 SETH’S PICK :: BARNABY VOL. 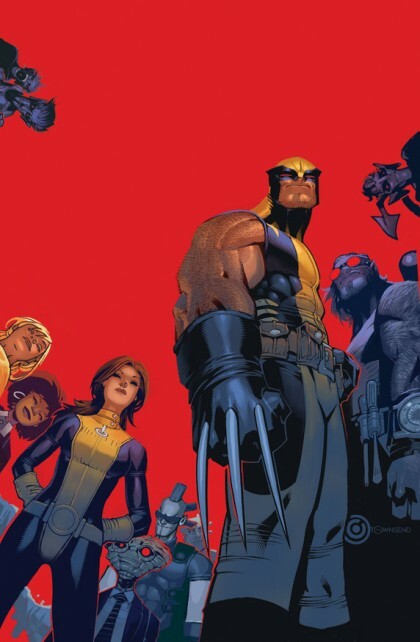 1 HC: With the behemoth of HeroesCon taking all our time and energy in recent weeks, we understandably put our weekly Staff Picks on temporary hold. That said, it’s good to be back writing about new releases. Regular readers of the Heroes Blog know well that Andy Mansell, stalwart blogger and HeroesCon panel coordinator, is something of an expert when it comes to comic strip history. You might think he’d be the one to talk about Barnaby, a long forgotten, under appreciated gem of a strip, but no, it’s me this time. Barnaby started in the early forties, and ran for over a decade. It was produced by cartoonist Crockett Johnson, who is best known for his timeless masterpiece Harold and the Purple Crayon. Though Harold is considered the classic, Barnaby received lots of critical acclaim in its day. One look at it and you’ll see why. To begin with, there’s the simple, fluid line work in Johnson’s art. Then you see the intricate typeset letters, which Johnson produced with a kind of mathematical clarity – he knew exactly how many letters would fit on each line of a word balloon. Then you have the subject matter. Though the stories revolve around five year old Barnaby and his fairy godfather (along with a ghost, lion, and more), the seemingly whimsical strip dealt with important issues in a way that didn’t talk down to children. Thus it’s one of those great strips that provided entertainment for young readers and their parents. I had the pleasure of seeing a Barnaby panel at last year’s Small Press Expo. 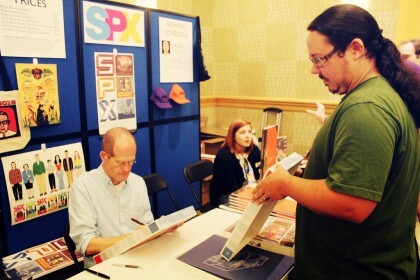 Panelists included editors Eric Reynolds and Philip Nel, and cartoonists Chris Ware and Daniel Clowes, who helped contribute to the book’s design. That panel got me excited about seeing this strip find its way to a new audience. I’m not a huge reader of comic strips, but this one has numerous seemingly disparate elements in it that tie together nicely. I hope some of you pick this one up and give it a try. Seth’s Pick :: Building Stories: I think it’s safe to say that this is probably the book of the week in terms of design and presentation. Like him or not, cartoonist Chris Ware deserves respect for his painstakingly-produced comics, and this is easily the most elaborate of the projects he’s produced thus far in his career. It’s a box full of comics of various sizes and shapes, each contributing to a larger narrative, but one that can be read in any order. The biggest selling point for me is that this enormous set of books is only $50, a price which pales in comparison to many hardcover collections with far less material than this one. I had a chance to purchase an advanced copy of this a few weeks ago, and you can link HERE to read my review of what will surely end up being one of the books of the year. We all have certain creators whose work we habitually return to that remind us why we love comics so much. For me, Mike Mignola, Dave Stevens, Eddie Campbell and Jacques Tardi all fall into that category. 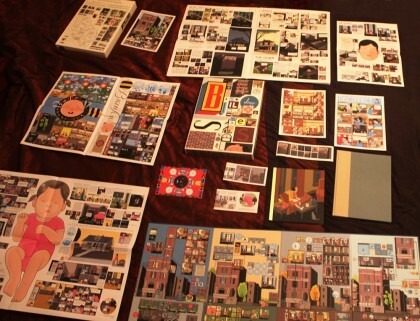 There is another name I need to add to that list – Chris Ware. This one might surprise some of you, if for no other reason than the notoriously tedious nature of his storytelling. It’s no secret that Ware’s books require some dedication from readers. Still, it’s hard to deny the level of skill that Ware employs in his cartooning, and the equally astronomical level of respect he has for the craft and history of comics. One of my personal highlights of attending last week’s Small Press Expo in Bethesda, Maryland was not only meet Ware and buy an advanced copy of his latest book, Building Stories, but to also attend a panel where he discussed his latest magnum opus at length. Here are some initial thoughts following my first reading of Building Stories. Walking through the halls of SPX with my new copy of Building Stories in tow, I felt not unlike I do whenever my wife wants to go to Ikea. I usually end up carrying a box the size of a small table of something or other under my arm, and I know it’ll take some time to construct the piece, but it’ll end up being some form of functional furniture. It’s really not until you crack Building Stories open that you really start to grasp the breadth of this project. It’s a box full of various sized comics in numerous forms. 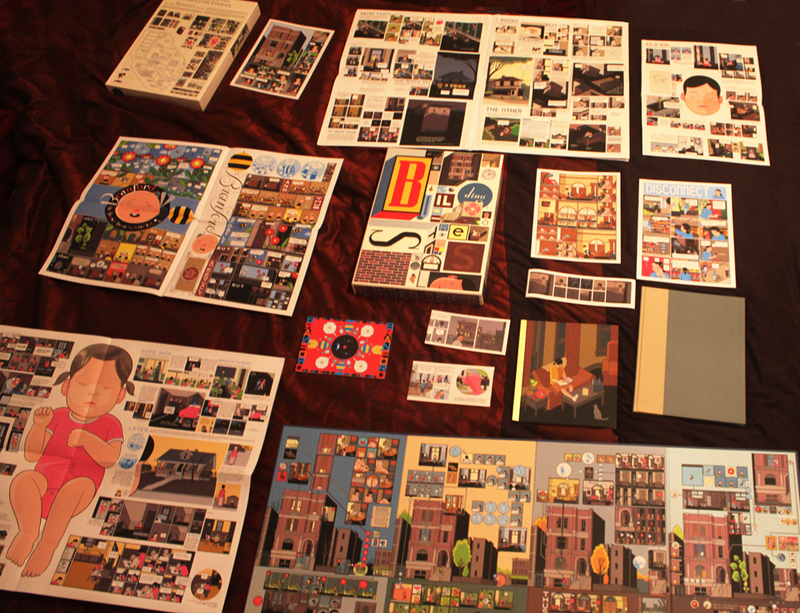 There are a few small folded strips, a larger hardcover (which reprints the original Building Stories found in Acme Novelty Library #18, a full newspaper full of comics, a folded game board complete with full diagrams of the building of the title, several large folded comics, and something that looks like a Golden Book that tells the building’s story in the building’s voice. It’s even worth pointing out the beautiful design work on the box front and back. I’m sure I left some items out, but needless to say it’s a lot of comics. When we unpacked the box Sunday night, it took up the entirety of our king size bed. 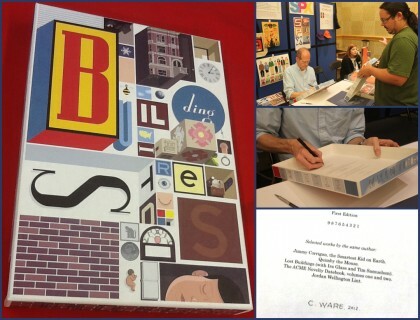 THIS JUST IN :: CHRIS WARE’S BUILDING STORIES SIGNED! 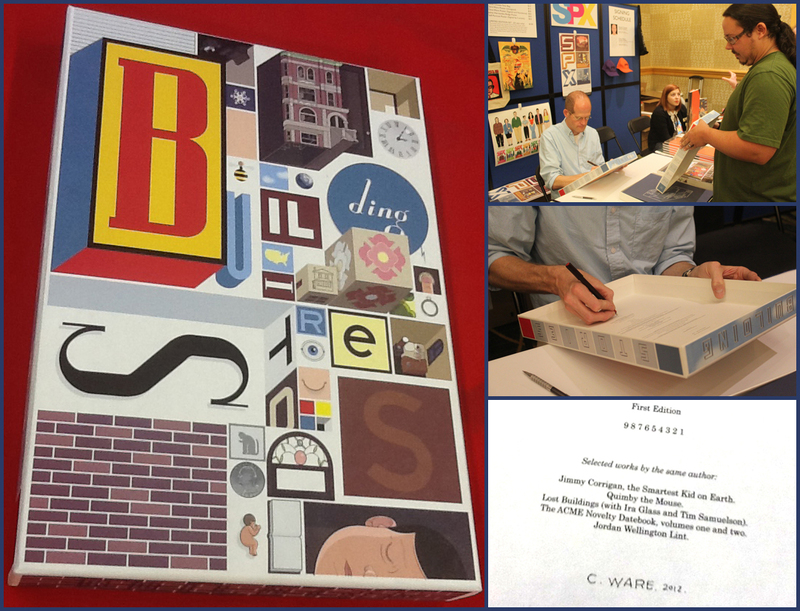 This past weekend at the Small Press Expo in Maryland, Seth was able to meet the genius cartoonist Chris Ware and pick up an advanced copy of his newest book, Building Stories, for Heroes. Since Ware was one of the show’s guest, we even got it signed! Building Stories won’t be available to retailers until next month, and Ware rarely makes convention appearances, so here’s your only chance to pick up an early signed copy of this amazing book. It’s hard to call this a book, since it’s a box full of books, newspaper comics, fold out boards and various sizes of strips, but it is an amazing set of comics however you look at it. Of course we’ll have several copies of the book in our store when it comes out next month but they won’t be signed, don’t miss this rare opportunity! Bid on this rare item now in our eBay store.